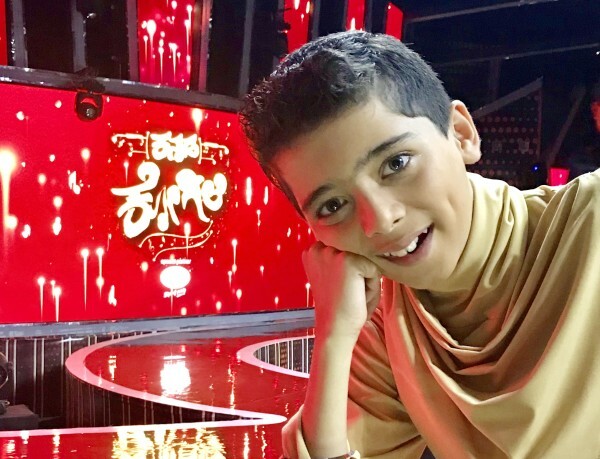 This 11 year old kid from Belagavi, Animish Hegde has mesmerized the audience with his melodious singing and most of the times the judges in the reality show Kananda Kogile have come on stage to compliment him on his spellbinding performance. This little champ sings classical songs with so much ease even the elders sometimes have a complex hearing him. His entry into Kannada Kogile a musical reality show being telecast on Colours Super Channel was accidental. In the mega audition he chose to sing Pt. Bhimsen Joshi’s famous song ‘Nambide ninna Naada Devateye’ from Sandhya Raaga, a musical film. It left Usha Uthup who was the judge for the mega audition mesmerized who said that in her next 10 births also she may not be able to sing like him. He has earned quite a number of admirers for himself. Now he has entered into Finals of the Kannada Kogile Competition in which contestants range from age 6 to 60. Studying in 6th standard of MVM English Medium school, Belagavi his family has musical roots too. His father Shreevatsa Hegde, is a lawyer practising in the High court of Karnataka while his mother Vibha Hegde is a lecturer in KLE’s College of Business administration CBALC. His grandfather Suresh Hegde; a retired Senior Geologist is also a Yakshagana artist. His uncle Shashank Hegde is again an accomplished Tabla player and a Yakshagana artist. Speaking to AAB, his father Shreevatsa said, his interest in music was since infancy. But his talent in music was discovered when as 3 year old he could sing tunes of quite complex Bhavageete and Bhaktigeete. He started learning devotional songs from his mother Vibha Hegde and he also had the courage to perform at small gatherings at that age. At the age of five his grandmother decided that he should start learning Hindustani Classical music. The musical journey of Animish had just begun, as he started taking lessons in Hindustani Classical Music from Shri. Mahesh Kulkarni of Mumbai in Kirana Gharana style. The lessons had happen via Skype or video calls and it was extremely important to have lessons from a Guru actually rather than virtually. At the age of eight he joined KLE’s school of Music in Belagavi and gradually Dr. Sneha Rajurikar; the head of the KLE Music School noticed his talent, prowess and seriousness in music decided to train him in Jaipur style of Hindutani Music. Animish has won prizes at the competitions held by Arts Circle, Belagavi, ISKCON, Saptaswara Foundation etc. he has won the title of Voice of Gadhinglaj 2018 and first prize in state Marathi natyageet competition at Kolhapur in 2018. Vibha Hegde, his mother said, it was his grandmother Asha Hegde who took him to Sirsi for training in Yakshagana and from the age of five Animish has been training in Yakshagana a well known folk art of Karnataka. Speaking to AAB, Animish said, my teachers at MVM School have been very supportive and the school takes pride in mys achievements. I will always to be grateful for the training and support received at KLE’s school of music and that the music school has the right environment, well qualified and kind hearted teachers. I have fond memories to treasure for life of Dr. Prabhakar Kore and the KLE Society felicitating him on the 27th of September 2018 and I would ever be grateful to his school MVM English Medium School and teachers, KLE’s Music School and teachers. He seeks the support and blessings of all music lovers for his finals to be recorded on 4th of December at Bengaluru. If you wish to vote for him please send an SMS – ANIM to 56882 . Previous articleResearch claims majority of dwellers are willing to move out from protected forest areas? Congratulations lil genius..You have made your parents proud….And all of us..
Congratulations to little wonder Animish his parents, music teachers. Music is eternal and gift of GOD , And GOD chooses very few to be great talent like Animish.